With the weather getting really cold here in Chicago already, my mind starts to go towards stews, braises, and soups. Being Jewish, a good chicken soup with matza balls is always a winner (at least the way I make it), but I wanted to do something different. Since my mom lives in Mexico I thought I’d make a Mexican-Jewish soup. I made a relatively classic chicken pozole verde but dropped some matza balls in the soup instead of tortilla chips. Most of the recipes I found online used a combination of store-bought chicken broth and water with chicken breasts. 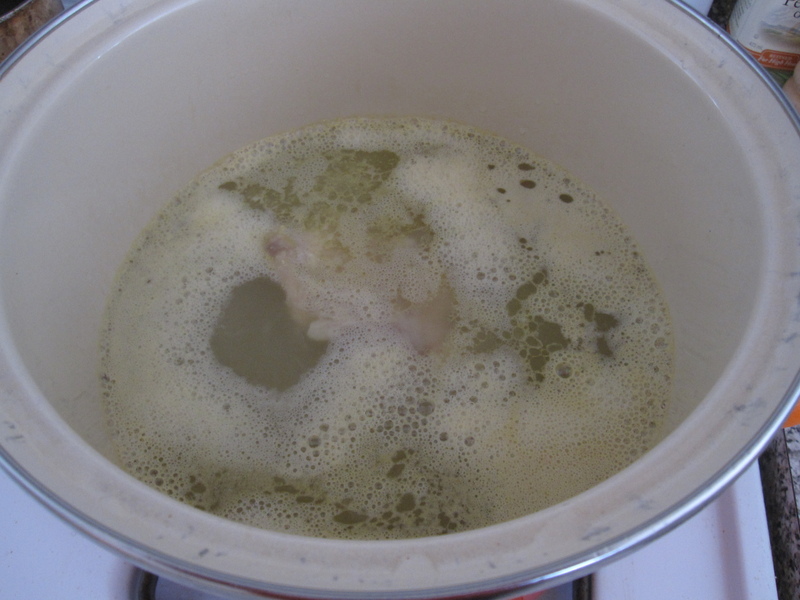 Making a simple chicken broth is really easy so I opted to use plain water and chicken thighs. Dark meat has much more flavor than white meat and I never use breasts when making a soup. What I did was bring 10 cups of water to a boil and then put 2 pounds of skin-on bone-in chicken thighs in. Once it came back up to a boil I turned the heat down to medium and let it simmer for about an hour. Every 10 minutes or so I skimmed the surface to remove the muck and some of the excess fat. Once I had gotten all of the chicken flavor into the broth I removed the chicken, took off the skin and bones, and shredded the meat. 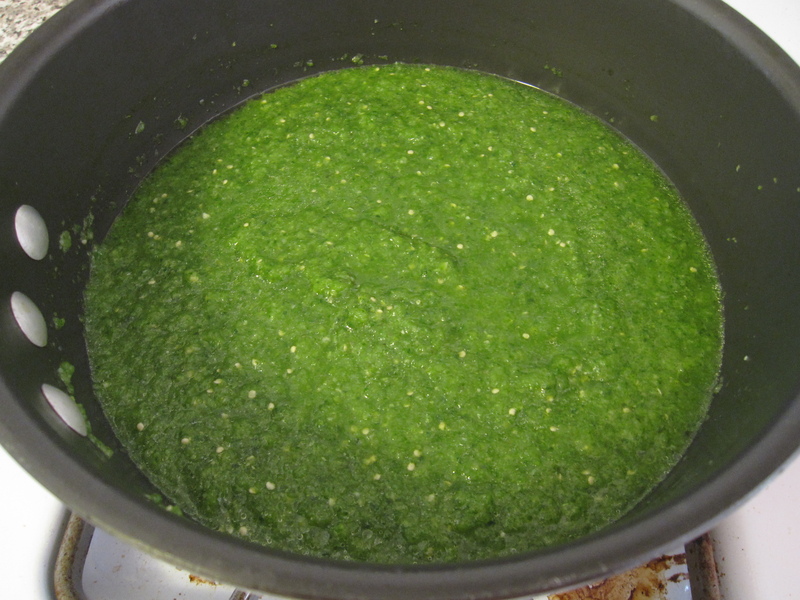 I set the meat aside while I prepared the verde part of the soup. The verde part is really just a simple salsa verde, much like you’d be served at a taqueria with chips. 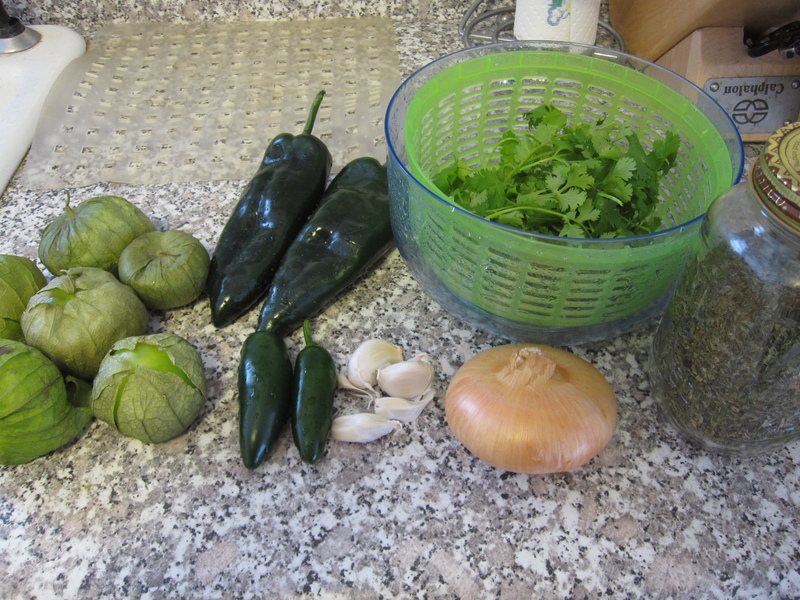 I used 1 pound of tomatillos, 2 poblanos, 2 jalapenos, 5 garlic cloves, 1/2 cup of cilantro, 1 small onion, and 1 tablespoon of dried oregano. I gave everything a rough chop and tossed it into my processor. 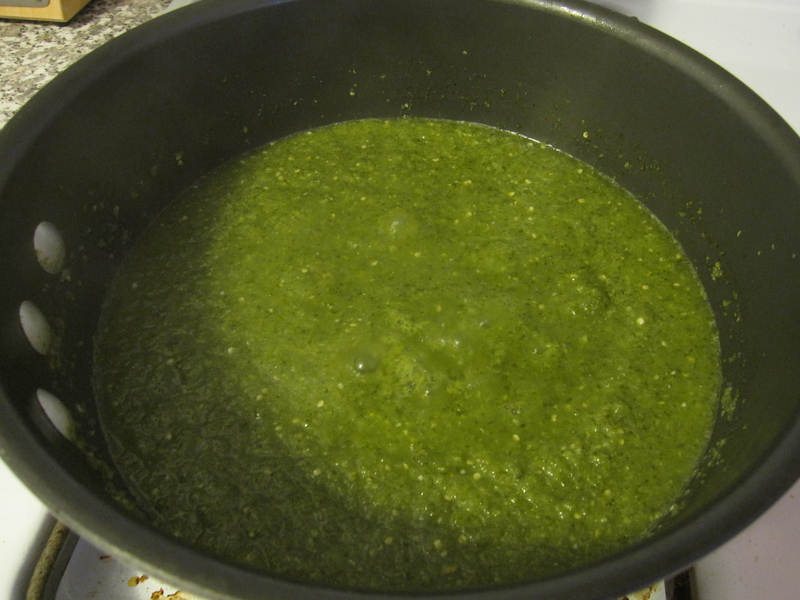 I processed it into a smooth salsa and added a ladle of the broth to make sure everything mixed nicely. …you can see it took on a much more drab color. That’s what you want in order to get rid of the raw flavors of the garlic and jalapeno and whatnot. 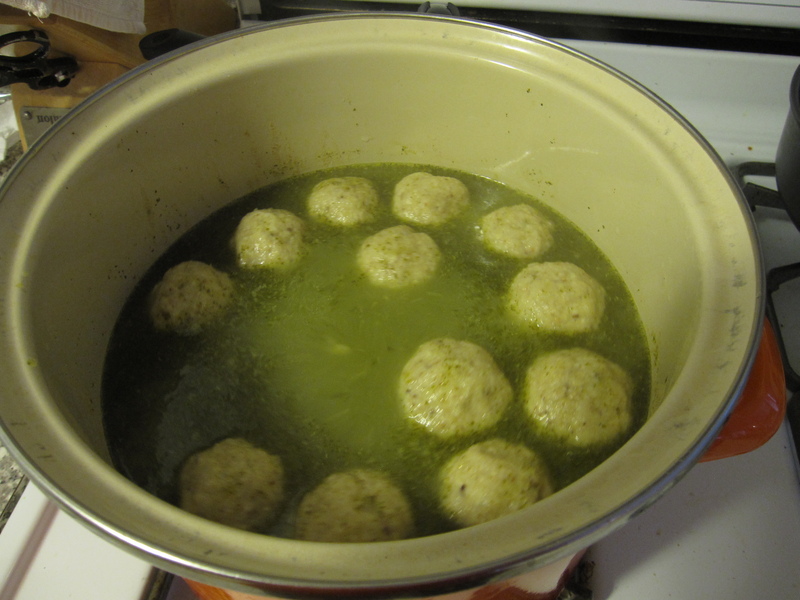 Then I poured it into the broth and made the matza balls. The last time I made matza balls my mom called me out for using matza ball mix. So, this time I did it from scratch. Honestly, there really isn’t much difference. 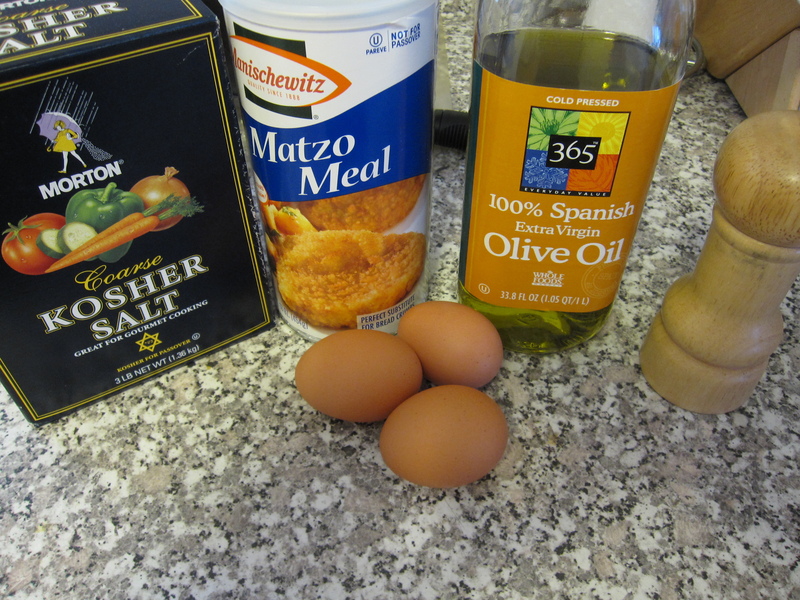 I used 1 teaspoon of salt, 1 cup of matza meal, 3 eggs, 3 tablespoons of olive oil, and some cracked black pepper to taste. I mixed everything thoroughly in a glass bowl, added about 4 tablespoons of cold water and mixed that in, then covered the bowl and threw it in the fridge for about 45 minutes. Then I got the accoutrements ready for the soup. 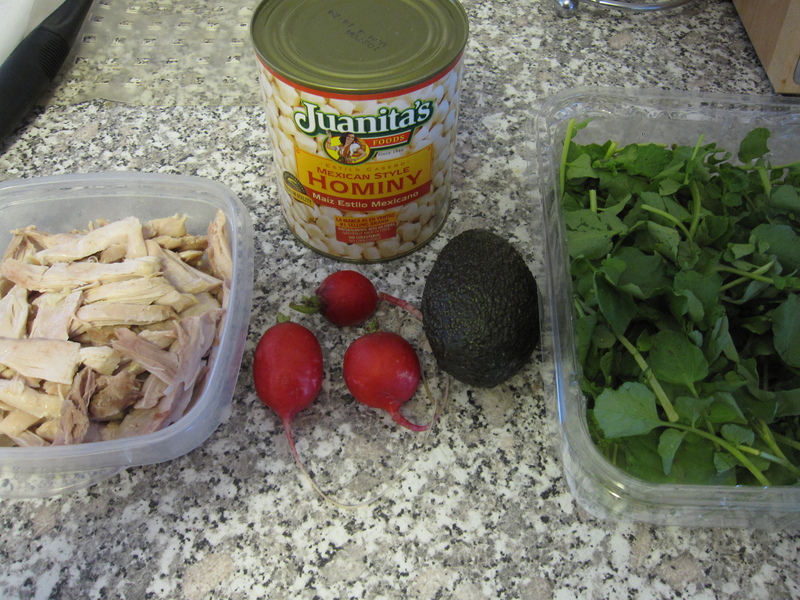 I got out the shredded chicken, 3 radishes thinly sliced, 1 avocado, a 28 ounce can of hominy drained and rinsed, and a large handful of watercress chopped. I added the chicken and hominy to the soup and slowly brought it back up to a low boil while the rest of the ingredients stood aside and waited their turn. When the soup was at a low boil I got the matza ball mix out and turned it into matza balls. With moist hands I rolled out balls about the size of silver dollars and dropped them in the soup. A lot of people cook theirs in plain boiling water and then add them to the soup. I’ll never understand why as that prevents them from absorbing the broth’s flavor. I want tasty balls! Once my balls were all swimming in the soup I covered it up and let them cook for about 30 minutes. For a side I just made a simple tomato and watercress salad. I quartered a bunch of cherry tomatoes, laid them on a bed of watercress, and drizzled some sesame dressing on top. 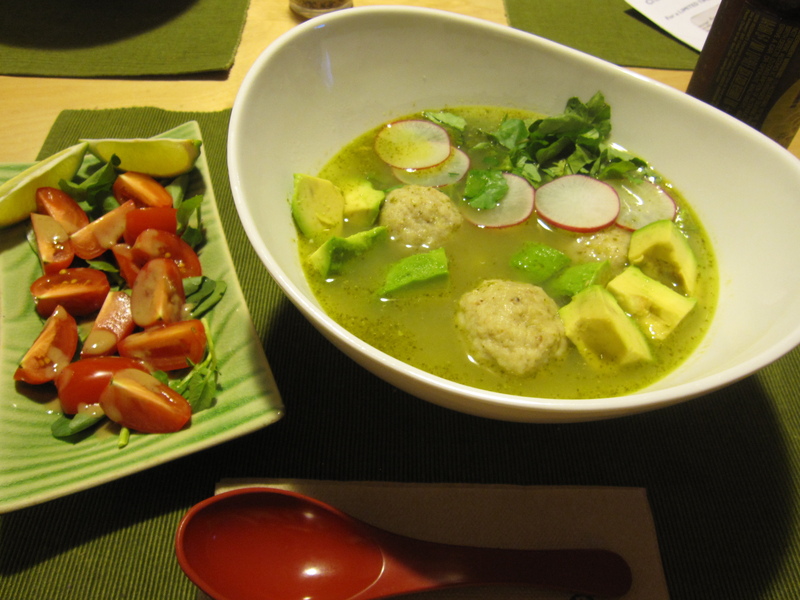 To garnish the soup I added the sliced radish, the watercress, I diced the avocado, and squeezed some lime juice in.